Living in our current age of technology, it is relatively easy and inexpensive for a musician to record a set of music and put it out for the masses. The ease in such an endeavor also makes it somewhat of a double-edged sword. Just because something is possible doesn't always mean it should be done. As such, sifting through stacks of releases to find those worthy of further exploration can be somewhat the bane of many music journalists today. 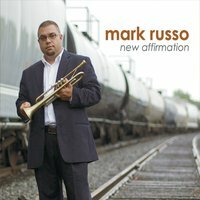 Coming out of a new era for jazz development that seems to be budding in the Cleveland/Akron area, trumpeter Mark Russo's debut set does indeed stand out in the crowd and features his own strong originals and the talents of some likeminded peers. An active teacher and mainstay on the Cleveland scene for many years, Russo's resume includes time spent with the Cleveland Jazz Orchestra, Bobby Selvaggio, and scores of other local ensembles. That he has studied well is evident in the many influences that can be gleaned by a close listen to this material. Both "TD" and "New Affirmation" lock into the pocket with a medium swing groove, with Russo's work recalling that of the late Kenny Dorham. The trumpeter paces himself across long phrases alternating with sufficient use of space. His tone is what stands out here, being burnished and on the dark side. Even on the faster and boppish "Hear Me Twice the First Time," Russo goes for the overall mood as opposed to mere displays of histrionics. Waltz tempos are obviously an integral part of Russo's muse. "Free Spirit" takes on a sunny guise with Selvaggio offering up a superb solo full of textural nuances that make his alto almost sound like a tenor in a few spots. "Grace" features some of Russo's best playing as his rhythmic ideas seem extremely well suited to the ¾ tempo. Take note of the way pianist Theron Brown picks up the torch for his solo which steps off of Russo's turn of a phrase. Although to be honest, Brown is at the top of his game throughout, be it on acoustic piano or Fender Rhodes. Based on the chord structure of "Stella by Starlight," Mark's "Stellar" hints to further influences, spelling the piano for the guitar of Jeremey Poparad. The unison melody line recalls the cool jazz experiments of Bob Brookmeyer, Jimmy Giuffre, and Jim Hall. Poparad steps up to the occasion with a fine solo statement, as does guest trombonist Adam Machaskee. Doing a full 360, the guitarist channels his best fusion tone and chops on "The Upper Echelon" with a bold statement a la Alan Holdsworth, although the piece itself is somewhat out of character with the rest of the material on the album. Tenor saxophonist Pete Mills is a strong ally for Russo and his tone too is of solid character and individuality. Each of his solo statements tells a story full of relevance and beauty. Furthermore, it should be noted that throughout this recital strong rhythmic support is supplied by bassist Ashley Summers and drummer Chris Baker, two up and comers who currently make their living as part of a thriving Chicago jazz scene. Shame is though that Baker's drum mix is somewhat dry and in the background all too often. With a bit more reverb or room ambiance the true timbre of the drums might have added further definition to the mix. Recalling the ECM recordings of trumpeter Kenny Wheeler and pianist John Taylor, the closing "Beautiful" finds Russo and Brown engaging in a heartfelt duet that provides the perfect nightcap to an adventurous set that is worthy of wider recognition. Track Listing: TD; Free Spirit; Speaking in Fluent IKEA; New Affirmation; Hear Me Twice the First Time; Grace; Stellar; The Upper Echelon; Wag's Chili; Beautiful. Personnel: Mark Russo: trumpet; Pete Mills: tenor saxophone; Adam Machaskee: trombone; Bobby Selvaggio: alto saxophone; Jeremey Poparad: guitar; Theron Brown: piano; Ashley Summers: bass; Chris Baker: drums.